What is more strange reality or fiction? What if the reality you think you are witnessing is in fact a fiction? Millions of Americans believe George W. Bush stole two elections in order to make it to the White House. Once when his BROTHER Jeb was in control of the final state to vote, FLORIDA and another where the Supreme court basically APPOINTED him the presidency. Obama was the hands down winner when he ran for office in 2008. Americans showed up in droves to support Obama’s message of Hope and Change. Now people have tasted the “Chef’s” food. It’s safe to say they don’t like it, and they are starting to ask questions. Questions that should be easy to answer. Who is Barack Obama? Why is it so difficult to answer this question? People know where other public people come from like Janet Jackson who the country has watched grow up on T.V. Politicians are the same as typically they get involved and are popular and public as they ascind through the ranks. John Kerry for instance was a well known athlete and people knew about him from practice, games, parties, etc. The Kennedy’s and the Clinton’s the same story good or bad people remember them. I have always wondered where did Barack come from? I mean seriously in order to make it to the highest level of United States president as a BLACK MAN shouldn’t plenty of people HERE know you? The last five or six decades in America have been filled with scandals, controversies, and amazing stories. Naturally as this happens all the public “leaders” chime in on the issue. Obama was in the prime of his career in the 90′s where was he on any of this stuff? The 90′s saw major events that changed this country permanently do you remember Obama ever appearing for any reason? What was he doing? Let me give you a personal story. Way before the bombings were being called terrorist attacks Florida A & M University was assaulted by some pipe bomb making racists in 1999. Jesse Jackson like him or hate him came down to Tallahassee and led a march to the capital to demand funding for security to protect the students at the University. It worked. This also proved terrorists can be defeated without giving up liberty. Where was Barack? When did he do anything like that? I remember clearly, I graduated college in 2000 I was paying close attention to what was happening. I’m not just narrowing this down to “black” issues either. Where was Barack on anything? Where did he protest or lead a company or play basketball or do anything that anyone can remember? Wayne Allyn Root graduated from Columbia the same year that Barack says he did 1983. He says that he had most of the same classes as Barack and he never heard of him and never seen him on Columbia’s campus? He says his friends don’t remember him either. How could this be possible? What if I told you that 400 Columbia students were asked by FoxNews if they remembered him from college and no one did. BARACK OBAMA DOESN’T KNOW YOU. WHY ARE YOU ACTING LIKE YOU KNOW HIM? I painted a post with VOTE OBAMA in 2008 in a community that was blanketed with Obama signs when he ran. You might be shocked by what happened to the post I painted. What does this mean to you? Obama said he would end the Patriot Act before he signed it again. 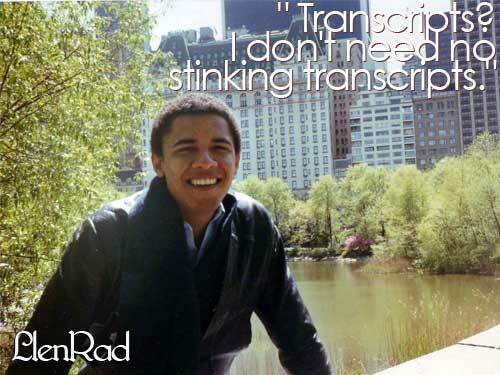 If he can justify tapping all American phones and reading all of our emails why won’t he show his college transcripts? What does he have to lose? If that Sheriff is lying about Obama’s birth certificate being a fake why won’t he take legal action against the Sheriff in court? Shouldn’t this be an easy case to win if someone is spreading lies from an official elected position? Shouldn’t this teach a lesson to anyone who wants to make stuff up and spread lies? What do you think?